I'm not usually one to jump on the bandwagon so a few years ago when my friend Myers suggested I start reading the Harry Potter series I just rolled my eyes. I eventually gave in, because anything was better than hanging out at the hospital watching my seven month old daughter in a drug induced coma...yes really. Anyways, I jumped and that wagon took off and now I own all books in hardback, read them at least every other year when a new movie comes out, and I'm sure they will be read alot more between me, Rick, and eventually Aren and Tatiana. So here we are a few years later, things have slowed down, and I hear talk about some vampire love book. My first thought was, "Give me a break. Vampire love?" I mean, there is Buffy and Angel, but come on, that is true love and that could only happen once in a lifetime, right? After recommendation upon recommendation from friends I finally opened up this book last week. I read the first chapter before bed, no big deal. Second chapter the next night, sleep came. Nothing the third night. Day four I picked up the book while Tatiana was napping and my house as I know it no longer exists. I read whenever I can, telling my daughter to shut up and watch Sesame Street because mommy has important things to do. I've stopped only to go to Phoenix to see a Cardinals game, and immediately upon returning, picked up the book again. I ran out yesterday to buy book two, accidentally bought book three, turned right back around and bought book two and then came home and plopped on the couch again, constantly telling Rick to step it up and take care of HIS kids. My reality is being taken over by a now eighteen year old girl who's boyfriend celebrates the anniversary of his seventeenth birthday every year, and from the looks of the book summary, a werewolf will eventually join my life. LOL MaryBeth! You crack me up! And when you think you're done? 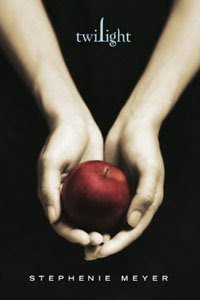 There's Twilight from Edward's point of view on her website, as well as "The Host," which I actually maybe liked a little better than some of the vampire books. welcome to the club. i used to hide in the bathroom and pretend to take a shower so i could read. it is addicting. Melinda, my house is gonna take a while, I'm sure. Emma, there's more on her website!? Man, I am so screwed. Welcome to the world of twilight. A world where your house looks like crap and you can't keep your hands off your husband because of the emotions you are feeling. I could only imagine what it will all be like when the movie hits the theaters at the end of November. Yeah!! The Host is good, but it takes a LONG time to get into it. I almost quit, but Jenna told me to keep reading... I am glad I did. I will be interested to find out if you are an Edward or Jacob girl... Happy Reading! I am embarassed to admit how into the series I was. Okay you do make me laugh like no one else can..... BUT I still have not picked up the book any of them... hmmm wonder when I may give in.